Looking for the best bulk SERP checker? If you have a large number of websites or keywords (100+), then you need a bulk rank tracker to monitor Google search engine rankings for your keywords all in one place. SerpBook is the best tool for bulk SERP checking because it allows you to check multiple keywords/domains in one location. You can easily create folders for each domain or niche then organize your keywords in groups. It takes less than 2 minutes to start tracking hundreds of keywords. 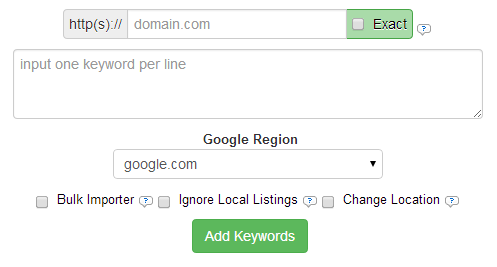 Enter your domain then copy and paste your keyword list in the input box. Check your Google SERP region and hit Add Keywords. Multiple domains/keywords can be added in using the “Bulk Importer” feature. Once this option is ticked, you can add in your domains/keywords in the format “domain1.com:keyword1” (one per line). You must select the corresponding language with the appropriate region if you decide to track a different Google region. If you need to track around 100 keywords, then sign up for the “Essential Plan” at just $19.97 per month. If you have over 100 domains, then you probably need to track at least 200 keywords. I recommend the “Professional Plan” for just $29.97 per month. SerpBook Coupon Code: Use the code “trial” to get 50% off your 1st month’s subscription!